Artists Helen Reed & Hannah Jickling will launch a new public artwork commissioned by the City of Vancouver, QA CHEW’S BUBBLE TROUBLE, across top trick-or-treating neighbourhoods in time for Halloween. The gum was named for Queen Alexandra Elementary School, the home of the artists’ ongoing residency, Big Rock Candy Mountain, supported by Other Sights for Artists’ Projects. The limited-run artist edition gum was developed over the past 2017–2018 academic year in collaboration with the toughest taste-testers of all: grade 6/7 students. The release will coincide with the opening of the group exhibition Mouthfeel at Western Front, on display from November 1–December 15, 2018. “We wanted our student co-creators to become skeptical consumers and also explore different flavour profiles,” – Hannah Jickling. 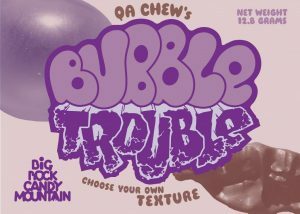 QA CHEW’S BUBBLE TROUBLE will be sold at the gallery; chewing gum in the exhibition is encouraged. On Halloween, the gum will be distributed at select East Vancouver locations, in addition to homes across Mount Pleasant, Commercial Drive, and the Hastings-Sunrise area. The Western Front will serve as the main distribution hub on October 31, 2018, from 5pm–8pm. The unlimited edition of QA CHEW’S BUBBLE TROUBLE will be available for free during the opening reception at the gallery on the 31st, available for purchase online and at select retailers after that. All proceeds from QA CHEW’S BUBBLE TROUBLE will go towards future art programming at Queen Alexandra Elementary School. Big Rock Candy Mountain is a public and participatory artwork and residency, situated at Queen Alexandra Elementary School since 2015. Reed and Jickling’s first food-based artist edition through the series was the chocolate bar SOUR vs SOUR. Mouthfeel at the artist-run centre Western Front will provide a contextual history to the commission, featuring several artworks that were shown to students during the gum’s research phase. This includes Dina Danish’s Brass Replica of Stone Age Chewing Gum (2013), Diane Borsato’s Artifacts in my Mouth (2003), and a number of Salt Licks, abstract forms created by cows who lick whorls into 50-lb cubes of salt and minerals used to provide them with essential nutrients. These surprising sculptures are presented at Whit Deschner’s annual Great Salt Lick contest, and are on loan from ranchers in Oregon. QA CHEW’S BUBBLE TROUBLE is commissioned by the City of Vancouver Public Art Program with additional support from . Big Rock Candy Mountain is supported by Other Sights For Artists’ Projects, with additional support from the Canada Council for the Arts, the British Columbia Arts Council and the Vancouver School Board. Images courtesy of Big Rock Candy Mountain.